Are hiking boots really essential for heading out on the trails? Or will a pair of low-cut trail running shoes suffice? It depends on your ankles and the type of terrain you expect to encounter. Here’s what you need to know about potentially saving some serious weight on your feet. Hiking footwear needs to do two primary things. First, it must provide your ankles with adequate support to prevent a sprain. Second, it must protect your feet and ankles from the abuses of the environment. Stability over uneven terrain is enhanced by a stiffer sole and higher ankle collar. If you have weak or loose ankles (e.g. you’ve sprained them multiple times in the past), then I recommend that you stick with a pair of stiff-soled hiking boots with a high ankle collar for maximum support. If you have strong ankles with no history of sprains, then a lighter weight, low-cut shoe with a stiff sole should prove adequate for most conditions. Keep in mind that a stiff sole is the most important footwear element for foot and ankle stability. Specifically, the stiffness of the shoe from side-to-side, or its “torsional rigidity,” which most effectively prevents your ankle from rolling over and causing a sprain. To test this, hold the shoe with a hand on the toe and a hand on the heel and twist it side-to-side. A high ankle collar adds stability as well, but is of secondary importance—a very stiff low-cut shoe will provide more ankle support than a boot with a high ankle collar but highly flexible sole. Another factor to consider is hiking terrain. There’s a big difference between walking a smooth path, which presents minimal potential for a sprain; and hiking over intensely rocky terrain, where your ankle will be subjected to serious side-to-side flexing. Even if you have strong ankles, the incessant flexing can fatigue your feet and ankles—a reason to opt for a hiking boot with more support. The final factor is pack weight. If you are carrying a heavy backpacking load, this can translate to additional stress on your ankles—another reason to look for footwear with quality support. Your hiking footwear needs to adequately protect your feet and ankles from the surrounding environment, such as water, mud, rocks, sticks, etc. A higher ankle collar provides considerably more protection, especially if you’ll be sloshing through mud or puddles; hiking over very rocky terrain, like talus or boulder fields; or traveling on sand, scree, or loose gravel that might slip into your shoe. If you expect to encounter such conditions only occasionally—and prefer to stick with a low-cut, lighter weight shoe—consider adding a pair of low-cut gaiters (usually referred to as “trail gaiters”) for protection and to help keep the mud and grit out. 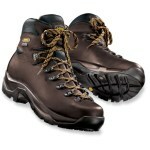 Hiking boots generally offer the best ankle support, especially if they have a reasonably stiff sole. Most feature a high ankle collar for additional support. They tend to be durable and most can easily withstand multiple hiking seasons without need of replacement. Their big drawback is weight and price, with most models weighing somewhere between 2 (lightweight boots) and 4 pounds (heavyweight boots) per pair and costing anywhere from $150 to $250 and up. Trail runners, on the other hand (er, foot? ), are essentially running shoes with stiffer soles designed for the rigors of running on uneven trail terrain. 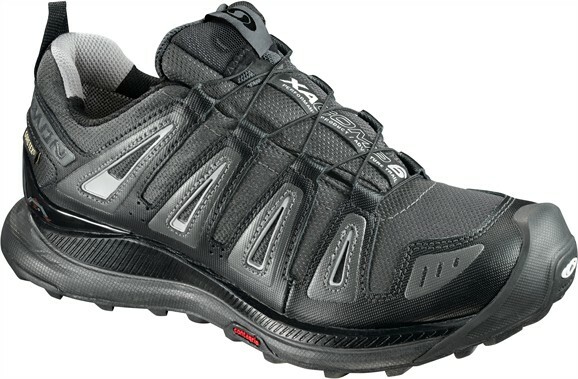 They weigh much less than a pair of hiking boots (a pair of the popular Salomon XA Comp 6 GTX Trail Runners pictured here, for example, weighs a scant 24 ounces per pair) and also usually cost less (roughly $120 to $150, depending on model). Many versions are also waterproof, outfitted with Gore-Tex (often identified in product names as “GTX”) or its equivalent. If you have good ankles, and don’t expect to hike in unusually rugged terrain, these are an excellent option. The big drawback of trail runners is durability—expect them to wear out after a single season of regular use. To provide maximum traction, the soles on trail runners tend to be made from a softer, stickier rubber, which wears down faster than the harder materials used on hiking boots. The lighter weight fabrics used to construct the shoe uppers also tend to wear out faster than the leather used in many hiking boots. So what do I wear on my hiking excursions? Unfortunately I have terrible ankles that I’ve sprained multiple times. As much as I wish it were otherwise, I almost always wear a pair of solidly supportive hiking boots. I envy those sure-ankled hikers out there—and encourage you to consider the tremendous weight (and effort) savings offered by trail runners when conditions are appropriate for them.